Irvin’s career in the construction industry started in 1989. Starting off as the general manager of Vittitow Basement Walls, Inc, he moved into the same role at Vitco, Inc., V.B.W. Waterproofing, and now at Redi-Rock K.I.T. 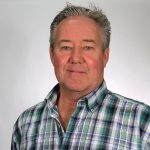 As an active member of the Home Builders Associations of Lexington, Southern Indiana, and Louisville, Irvin has years of experience in the hardscapes industry. This experience has allowed Redi-Rock K.I.T. to provide another quality product—Redi-Rock retaining walls—to our valued customers in the Louisville area. He also worked on The Extreme Home Makeover house both on the install and the planning. Irvin enjoys hunting hiking, golfing, and most other outside activities and currently lives in Elizabethtown, Ky. with his wife Linda and daughters Madeline and Meredith.